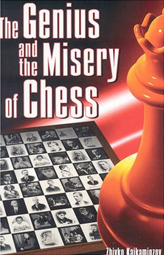 The Genius and the Misery of Chess offers brief profiles of the lives of forty-seven chess players from As-Suli (880-946) to Magnus Carlsen. The book often focuses on the eccentricities and sufferings (mental, financial, and corporeal) of the personalities in question, especially when dealing with players from the pre-Fischer era. It also highlights one or two games from each player, with one or two diagrams per game. The author is an editor of the Bulgarian chess magazine Chess Thought and has been a journalist for over ten years during which time he has penned thirty-three books. He is also an international arbiter and was one of the referees for the Kasparov-Karpov match in London in 1990. This is an interesting concept for a book; however, as with many English language titles that are produced outside of the U.S., a better job could have been done concerning the editing and grammar.